The Royal Canadian Air Force was created on April 1, 1924. It drew together many of those who had served in the Royal Flying Corps and Royal Naval Air Service during World War I, and in the Canadian Air Force of 1920 to 1924. In 1968, with the unification of the Canadian Forces, the RCAF lost its formal title; however, its proud traditions live on in Canada's current Air Force. The accomplishments of the men and women who served in Canadian Military aviation, to preserve and protect our country and the freedoms it represents, are highly significant. Many gave their lives in the performance of their duties: we must ensure that their sacrifices are never forgotten. In 1984, a first step in that direction was taken when a small museum was opened at CFB Trenton. 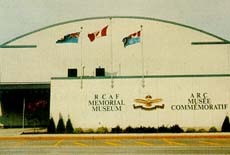 In recognition of its important status, it was granted exclusive use of the title "RCAF Memorial Museum". Outstanding success was achieved in gathering and preserving a varied and fascinating collection of artifacts and memorabilia. 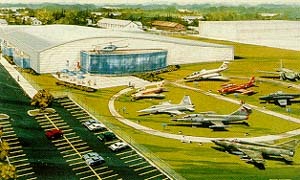 By 1992, the need for a new and larger facility had become very evident and plans for an expansion program were initiated. A fund-raising program was launched in July 1993 and a total of $335,000 was contributed by donors from across Canada. The function of the Museum is to perpetuate the heritage of Canadian Military aviation and it is dedicated to the memory of the airmen and airwomen who gave their lives in both peace and war. 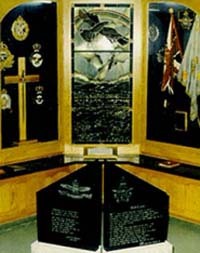 Because of the diversity and number of artifacts and memorabilia, the RCAF Memorial Museum differs from traditional "Air" museums. As the displays clearly illustrate, emphasis is given to the social and historic facets of Air Force life and operations. 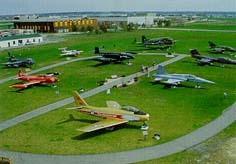 In the spring of 1984, the museum moved into a 13,000 square-foot building situated within a large Air Park on a public road that provides unrestricted access for visitors. The new facility accommodates a greater number of displays and the annual attendance figure has grown to 45,000. The adjacent Air Park has quickly become the home of an extensive collection of aircraft valued at over $4 million. Funds permitting, the inventory is expected to grow as aircraft of significance become available. An extension to the museum, providing an additional 7,200 square feet of space, was added in 1996. 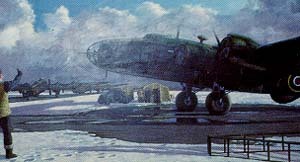 This area is being used initially for the refurbishing of the Halifax bomber which was recovered from Norway's Lake Mjosa in September 1995. The aircraft had been shot down by German anti-aircraft guns in April 1945. Acquisition of what will be the world's only completely restored Mark VII Halifax bomber has brought with it a major challenge. Not only is it a very large four-engine aircraft but it was constructed when fabric was used for the control surfaces; therefore, it must be housed indoors. Other fabric-covered aircraft the Museum intends to display fall into the same category. At the same time, the volume of donations of artifacts and memorabilia continues to increase and, once again, the Museum's inventory has outgrown its housing capacity. Accordingly, we must now move quickly into the next phase of the expansion program which involves a further extension to provide a total space of approximately 64,000 square feet. The present complex will undergo a major construction program which is scheduled to begin in late 1997. To fully fund this expansion, which is expected to cost almost five million dollars, a major fund-raising program has been initiated. A recognition policy is in place to honour those who make monetary donations to the RCAF Memorial Museum. Donors at all levels will have their names inscribed in a Donors' Register that is displayed in the museum. A "Donors' Wall" highlights specific aircraft plaques which are allocated according to the donation level. An "AD ASTRA" Commemorative Stone program has also been established. All those having links to any of Canada's Air Forces are invited to participate.